I'm planning on posting a longer message at some point in the future with details on SB2, but here is a little info for you to get started and answers to your questions. First, I'm assuming that you've already seen this, but you can find a little bit of documentation I've written at the Assembla page, including how to download and install the plugin. Before I get any further, let me say this to anyone reading this: Don't even think about installing SB2 on a live church site. You will regret it. It's not ready yet. That having been said, feel free to download it and install it on a test site. SB2 was designed to happily coexist on the same WordPress installation as SB1. So you can run them both at the same time with no problems. They each have their own "Sermons" menu on the Admin screen. They don't share sermons (although they can share attachments), but SB2 does have a working Import feature. You can import your sermons from SB1 into SB2. The sermons will also stay in SB1, and you'll have sermons both places after the import. SB2 is coming along, but the place that needs the most work yet is the front end. SB1, as you know, shows sermons on a WordPress page using the "sermons" shortcode. 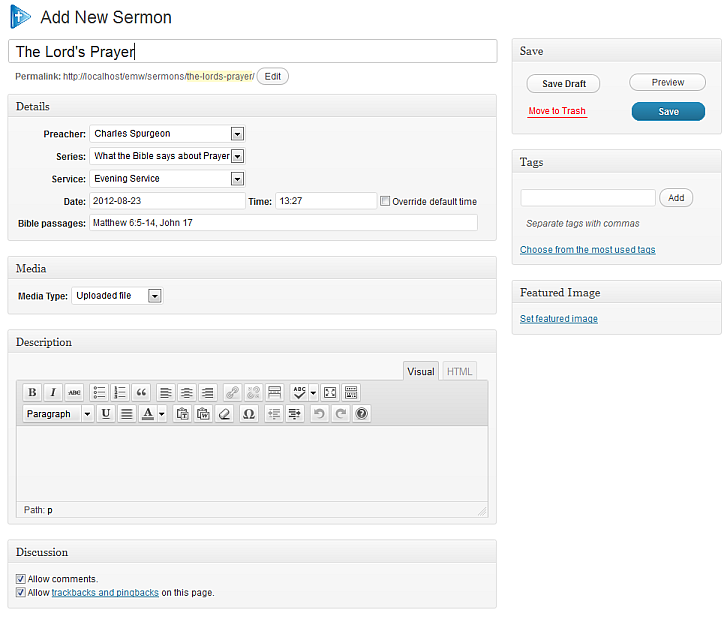 With SB2, the URLs to the various sermon pages are defined on the Options screen. Here is where you type in what you want the URLs to be. For example, if you want your sermons page to be at example.com/sermons, just type "sermons" into the Sermons Permalink box. (This is the default.) If you currently have a WordPress page with "sermons" as the slug, you might have a problem, so you'll need to either change the permalink here to something else, or change the conflicting page slug to something else. These options only work if you have the pretty permalinks turned on (Settings, Permalinks). If you don't, there are other URLs, but I won't get into that right now. The Files menu doesn't do anything right now. The functionality that was in the SB1 Files menu is now located in two other places with SB2: The WordPress Media library (for "normal" attachments) and the Edit Sermons pages (for "legacy" attachments: imported from SB1 or uploaded via FTP). Because of this, I'm planning on removing the Files menu from SB2, I just haven't gotten around to it yet. first, how can I fix the audio player to find the sermon file? and can I go back to using the url query for the download link? Thanks for trying out SB2. I'm not sure what is going to happen with the Templates menu yet. There is some discussion on Assembla on what kind of system we want to use to customize the look of SB2's frontend, but it is still undecided. Is your test site publicly viewable? If I can't see it, I probably won't be able to troubleshoot it. Which audio player are you using? I'm curious: why do you want the download link to use the URL query string? I am using Audio Player for my audio player. Is there a better plugin to work with SB2? I did notice that clicking on the flash audio player returns a 'Failed to load resource: the server responded with a status of 404 (not found) http://localhost/omega/audio/' - there is no such directory on my site - so the 404 error makes sense, but why is it looking for the 'audio' directory on the root level? The benefit of the URL string to me is that I prefer not showing everyone my site structure. But it's not a big deal. The reason that you are getting "File Not Found" errors in Audio Player is that your "Audio shortcode" setting at (SB2) Sermons, Options is incorrect for Audio Player. Yes, there is a better audio player to use than the old Audio Player plugin. If you are using WordPress 3.6 or later, you can use the built-in media player. This is what the default "Audio shortcode" setting is designed to use. If you want to use it, just deactivate the Audio Player plugin and use the default setting for "Audio shortcode." By the way, this is also true for SB1: I recommend the built-in WordPress media player for that as well. More details in the forum FAQ. If you are running an older version of WordPress than 3.6, you can use the MediaElement.js player, and the settings are also in the forum FAQ. with actual square bracket characters [ ] in the appropriate places. I was planning on leaving an actual link to the media file attachments in SB2, as I have seen lots of issues with the redirecting done in SB1 here on the forum. I'm certainly willing to revisit this, though, if someone can convince me that it is a good idea to do otherwise But I don't think that Security Through Obscurity qualifies as a good reason all by itself. OK, I ditched the old Audio Player, changed the shortcode and now I'm up and running. I appreciate your help. Any ballpark date on when version 2 will be available? No, I have no estimated release date for SB2 to announce at this time. I would like to mention that I been using SB2 on my live site since it came out in August of 2013 and I haven't had a problem with it as of yet. Is there a beta of SB2 I could try out on my Development/Test site please and thank you. I hope that I am not stepping on any toes with my post about SB2 🙂 I really love using SB2 on my live site and I haven't had any problem with it as of yet. Ben, I know that you been updating SB1 but as soon as I heard that this was out in alpha stage I install it because I was having a problem with SB1 updates and with the ease of SB2 I took a chance on it and install it on my live site. If you want to put my site up on https://www.assembla.com/spaces/sermon-browser-2/ please feel free to for people that want to see what it would look like on a live site. Also it is a DREAM to USE, thank you so much Mark and you too, Ben for work on improving Sermon Browser. Please keep up the great work and God bless you both. As many of you will know, SermonBrowser has been creaking a little with the release of WordPress 3.4. That's because SermonBrowser is 4 years old, and was first released for WordPress 2.3! What many will not know is that the age of the SermonBrowser code means that it's difficult to update. It doesn't take advantages of many of the new features of both WordPress and PHP, so it's more complex than it needs to be. On top of that, I've learned a lot about programming in those four years, and there's things I'd do more efficiently now than I managed then. I have spent quite a long time trying to make SermonBrowser 100% compatible with recent versions of WordPress, but I've have come to the conclusion that the only way this is going to happen is for SermonBrowser to be entirely rewritten using all the modern WordPress standards such as custom post types. You'll be glad to know that rewriting SermonBrowser has begun in earnest, and one of my employers is supporting the project by allowing me to do some of the coding during work time. Version 2 of SermonBrowser is still months away. SermonBrowser is about 4,500 lines of code, so you'll appreciate that rewriting all of that from scratch will take time. But my employer needs the new version by December at the latest, so that is the target. Although the new SermonBrowser will be completely rewritten, you'll be able to import all of your existing data, and I'm intending that templates will work in a very similar way. The new version of SermonBrowser will require at least WordPress 3.3. Here's a screenshot from the current development to whet your appetite. I'm really happy to hear that you are enjoying SB2 on your site. And no, you aren't stepping on any toes. 🙂 As I said, it's not done yet, but I appreciate the feedback, and if you have any more feedback, I'd love to hear about it. Thank you for all of your hard work with this plugin. We have been using it on our church site for several years now and am looking forward to the release of version 2. I downloaded the alpha release and tested it on a demo site that I have. It looks great! When I installed it into a site that I have SB1, the import feature doesn't show up. Any ideas why that might happen? Thanks again for all of your help, praise God for all your effort in bring the Gospel into the world through the web. When you have both SB1 and SB2 activated, you'll see two "Sermons" menus in the main Admin menu. SB2's menu is further up the list, and SB1's menu is toward the bottom. Would you list for me all the choices you see under SB2's Sermons menu? I don't see the import from a prior version option. Thank you Ben for your help. I'm not sure why you don't have the "Import" and "Uninstall" options. Perhaps you are using an old version. When did you download the latest version from the SB2 Assembla site? In your plugin, go to sermon-browser-2/includes/admin.php. Look for the function mbsb_add_admin_menu (around line 779). I'd like you to copy the text of that function (it's about 10 lines long) and paste it into Pastebin.com. Then post the resulting URL here. Tried out the import feature worked like a charm for 65 of the 83 sermons in SB1. Stopped there and will not pick up the rest. Today I manually added sermon 66, worked like a charm until I start to attach the various files in this case there is 1 PDF file, 1 PPTX, 1 MP3 and and 1 video. Of the lot SB2 only accepts the video. this is my sermon browser 2 test page - http://churchofourlord.org/sermons/ which I have not yet tweaked. This is on a live site but I've not added these pages to the published navigation. Fred, I can't explain why you don't see the Import option. Are you by any chance running a theme or plugin that allows you to rearrange or hide options on the admin menu? I would suggest temporarily deactivating all other plugins (except SB2) and see if the Import option appears. If that doesn't work, try temporarily switching to one of the default themes (like TwentyTwelve, TwentyThirteen, etc) and see if the Import option appears.